Microsoft SQL Server refers to the relational database management system which was developed by Microsoft and primarily performs the functions of storing and retrieving the data based on the requests made by other software applications regardless of whether the said applications are running on the same PC or on another unit across a network. The version of the SQL Server which was released by Microsoft on the 6th of August 2008 uses the SQL Server Always On technologies designed to make the process of managing all types of data self-organizing, self-maintaining and self-tuning to guarantee a downtime of almost zero. The SQL Server 2008 is also popular for its codename Katmai and comes with a reliable support for both semi-structure and structured data such as digital formats for videos, audios, pictures and any other multimedia data. This system also serves as a backend for data storage which works perfectly for various types of data including XML, file, spatial, document, calendar or time and email. You can also expect the system to work perfectly in performing the process of analyzing, inquiring, sharing, searching and synchronizing data. One of the most notable qualities of the Microsoft SQL Server 2008 is the presence of its compression features that are effective in enhancing the scalability of data. It also features enhance indexing algorithms, filtered indexes, Resource Governor feature which works in reserving various resources for specific workflows and users, transparent data encryption, backup compression and a reliable framework for declarative management which works effectively in configuring constraints and policies on certain tables or the whole database in a declarative manner. If you want to gather more information about the SQL Server 2008 version, then you should consider enrolling in a Microsoft SQL Server 2008 certification course. A good choice would be the Microsoft SQL Server 2008 course offered by Brainmeasures since this online certification company has been around for quite some time already and has never failed to satisfy those who have tried to enroll in its certification courses. What you can get from this certification course from Brainmeasures is a reliable and comprehensive Microsoft SQL server training which supplies the most accurate information about the field. This Microsoft SQL certification program offered by Brainmeasures can also help you gather essential information about the system including more than a dozen of its different editions that aim to benefit different types of audience with different workloads. Completing this program is very rewarding as this will allow you to finally grab a copy of your SQL server certificate. 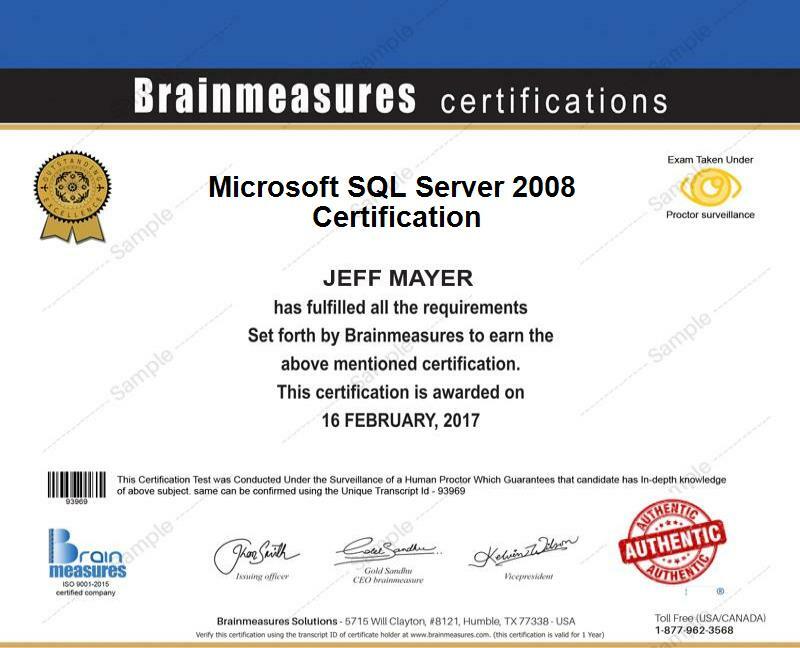 The comprehensive Microsoft SQL Server 2008 certification program from Brainmeasures has a lot of beneficiaries. You can expect this certification program to work perfectly for you if you are an SQL Server database administrator, developer, system engineer or implementer whose tasks and responsibilities include monitoring the entire system and maintaining or improving its good performance. Microsoft SQL Server 2008 certification holders can expect to earn a huge amount annually. If you get hired for administrative SQL Server positions, then your annual income can be expected to range from $53,000 to $102,000. If you get high-ranking positions like those that are on the senior level, then your annual earnings can reach up to $135,000.